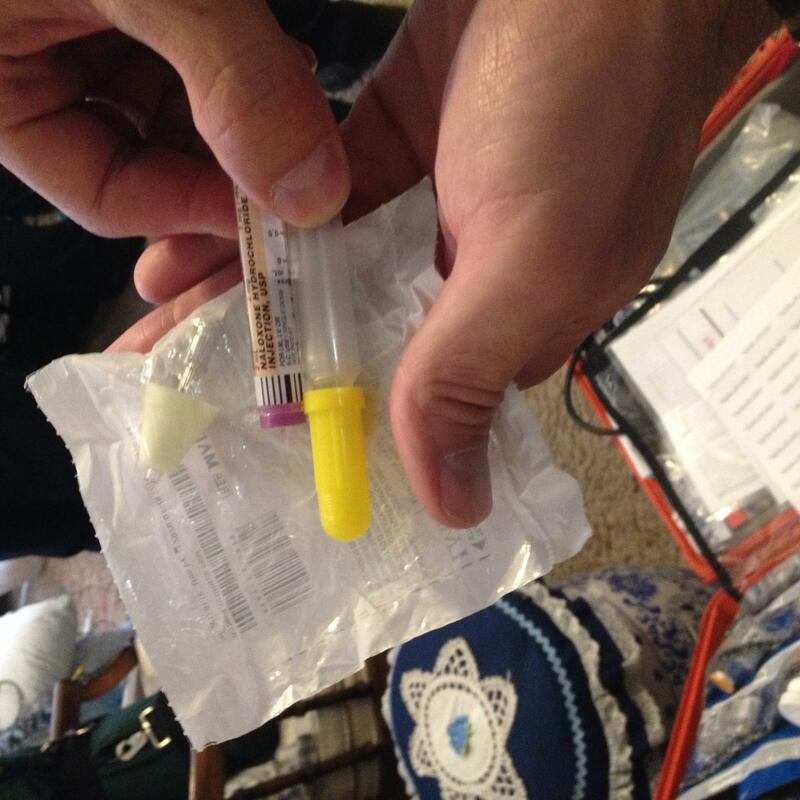 Captain Sean Barrett shows the apparatus used to give the opioid reversal drug Narcan to overdose victims. What started as a research project for a Spokane Valley fire administrator has turned into a useful tool to evaluate the city’s opioid use. The project compiled data from overdose calls and the number of times in which the drug Narcan was administered to reverse the effects of opioids. It also tells fire officials about where many of those calls originate. Rich Llewellyn is the Spokane Valley Fire Department’s division chief of emergency medical services. Several years ago, he was a paramedic often assigned to opioid overdose calls. In 2014, he noticed the number of calls seemed to sharply increase. “But I didn’t have a good data-driven analysis or understanding of where we were at with opiates in the Spokane Valley. What’s happening here beyond my gut feeling or everyone else’s gut feeling?” Llewellyn said. So Llwellyn adopted this as a research project for a class he was taking with the National Fire Academy. Using an electronic health records system developed by a company called ESO Solutions, he was able to gather data on overdose calls from the last quarter of 2016 through the first three quarters of 2017. “In one year, we administered Narcan to 88 separate patients, some patients got Narcan on more than one occasion," Llewellyn said. The total was 129 doses. Sometimes it took more than one dose during a single visit to revive a patient. A few people were seen multiple times throughout the year. “Kind of validated my thoughts that we were giving a lot of Narcan, but I didn’t know where it was at relative to years before. We didn’t have a great system for finding that out,” Llewellyn said. Those figures give Llewellyn a baseline to which future years can be compared. For example, this year, he says, the department has administered about 19-percent Narcan than the year before. One of the highest usage areas is in the north central part of Spokane Valley, not far from the doors of Station 8, where Captain Sean Barrett is based. Barrett takes us on a ride along. In between going to medical calls, he tells us where medical technicians respond most often for opioid overdoses. “This, where we’re going right now, for example, is Crossland Studio, so that’s a transition housing area. We see it in those areas, maybe see it in pockets where we have hotels, motels that are lower socioeconomic," Barrett said. It’s an area with a highly-transient population. Barrett says, not only are paramedics going to more opioid calls, they’re seeing a change in the types of opioids people are taking. That, he says, is much more powerful than even fentanyl, considered one of the most toxic substances. So, what to do with these new figures? Rich Llewellyn has an opioid prevention campaign in mind. “We’re going to work with the Spokane Regional Health District in order to develop some co-branded information on opiate awareness, opiate signs and symptoms, where to get help, what to watch for in others and how to address those problems," Llewellyn said. The goal is to share that information with the people in some of the areas where overdose call volumes are highest and, he hopes, to reduce the number of calls needed to revive opioid drug users.